Marketing Mix is also called "Four P's of Marketing" as it mainly focuses on product, price, place and promotion. 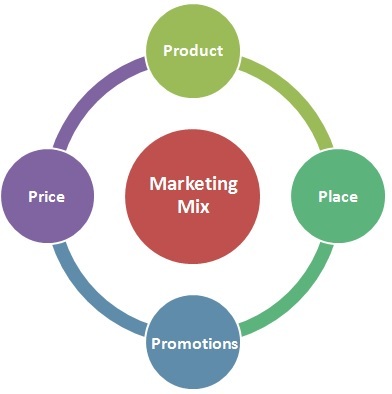 These four elements of marketing mix help to place a right product, at right time, at right price at a right place. Each element has influence on the others and can be adjusted to get the right combination. The four P's of marketing are discussed below. It will help you understand why market research and market understanding are required to design an effective marketing mix. Aesthetic appeal: Are the products and packaging visually appealing or not? Features/Benefits: Does it provide the features and benefits that a customer is expecting? Functionality: Functioning smoothly or not? Competition : Is it able to compete with other similar products or services available in the market? Reliability: Is it durable or not? Cost based pricing: The cost of production, distribution and promotion are calculated. Accordingly, the product or service is priced to recover the cost incurred as well as earn the profit. Skimming: Company launches its new product at relatively high price in an effort to recover the costs and gain maximum profit in shorter time. Later, it may reduce the price when similar products are available in the market at low price. Penetration pricing: Company offers its new product at relatively low price. It helps the product to attract more customers and easily enter into the market segment. Once it captures the required market share, the price can be increased. Economy pricing: Company keeps the production, marketing and other costs low. It also keeps the margins very low so that the product could be offered at low price. The product should be available at the right place. The place where a buyer would expect your product and your product would be noticed by plenty of buyers. This element of marketing mix covers the entire distribution system. You can study the existing distribution channel and accordingly design yours to make your product efficiently reach the desired places. The distribution channel can be direct or indirect. In direct distribution, your product reaches direct to customer without involving any intermediary. The indirect distribution may involve intermediaries like agents, retailers, wholesalers, internet and distributors. Promotion involves making people aware about the presence of your product. Through promotion companies differentiate their product from other similar products. They educate people by providing relevant product related information and encourage them to buy. There are many ways to promote a product or service. Out of these you can choose the best ones that suite your budget and strategy to create an effective promotional mix.